Since its establishment in 1989, the University of Cyprus has consistently pursued excellence, fulfilling its mission to the Cypriot society. Today, the University is recognized as the most important research and higher education institution of Cyprus, and has also, moreover, been honoured as a 'distinguished Mediterranean University'. Currently, the University comprises eight Faculties and 22 Departments offering a wide range of undergraduate, postgraduate and research study programmes to more than 7000 enrolled students. 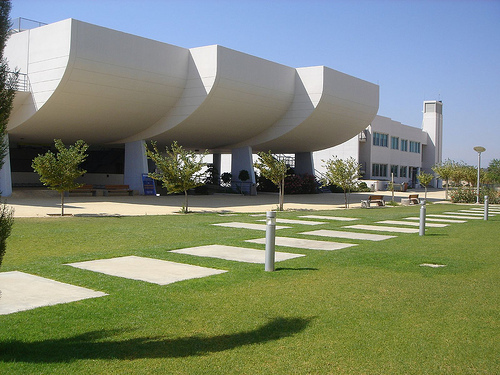 The University employs over 900 people in its academic and administrative staff. As the University is now a member of the international network of universities and an active participant in the research community worldwide, our vision is fully realized. The University believes that freedom of education must go beyond national borders, and for this reason our very active participation internationally is essential. This involvement not only enhances our goal to provide our students with an education equal to that of the best universities worldwide, but it also enhances the University's international reputation. 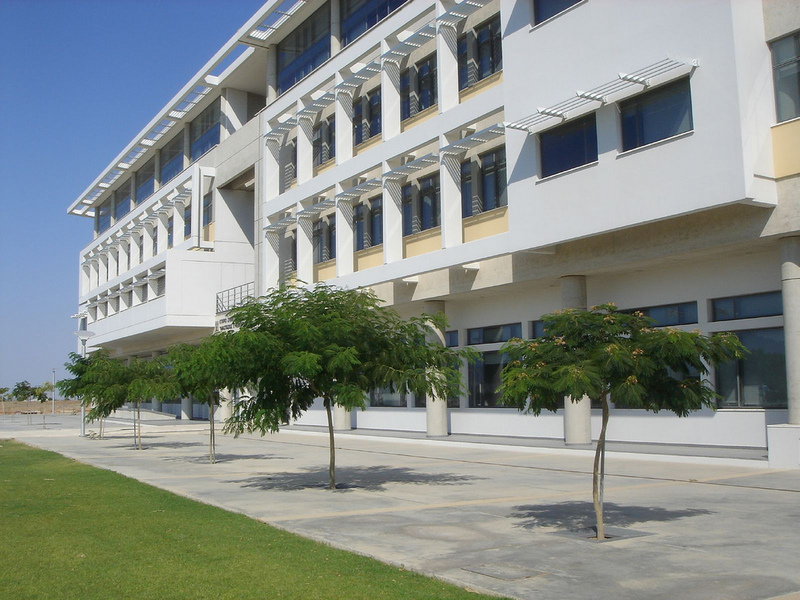 The new University is located on the outskirts of east Nicosia, between Aglantzia and Athalassa, and covers an area of approximately 1.2 square kilometres. The new Facilities will eventually host all faculties, the departments, and teaching activities of the University. More information about University of Cyprus - New Campus. 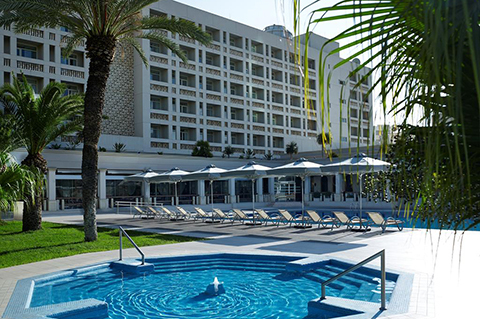 Hilton Cyprus is the only five-star hotel in Nicosia and counts 40 years of operation. Just 35 minutes from Larnaca International Airport, 1 hour and 36 minutes from Paphos International Airport and only 10 minutes walking distance from the city centre, shopping and entertainment areas; conveniently located next to the business district. The hotel has 298 rooms available; out of which 19 are suites and 76 Executive rooms. Guest facilities and services include a Business Centre, hairdresser & barber, bookshop, bank, taxi and car-hire services and free car-parking facilities. 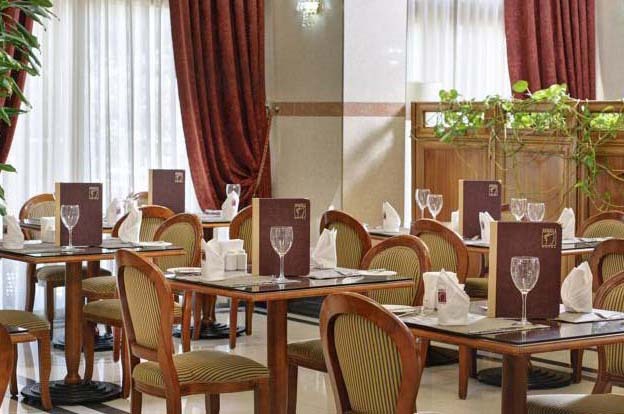 The Salon serves the finest traditional and international cuisine. 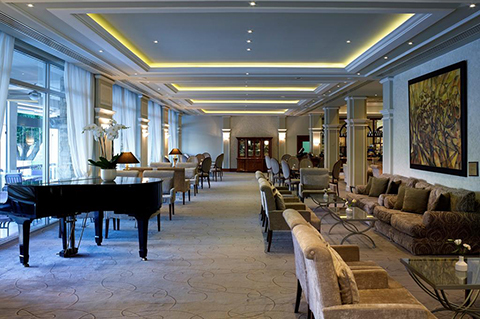 The Atrium Lounge where guests can relax and enjoy aromatic coffees and delicious desserts. The Paddock Bar with live piano music and selection of cocktails. Pergola Grill & Bar (Seasonal) enjoy refreshing cocktails and tempting snacks. 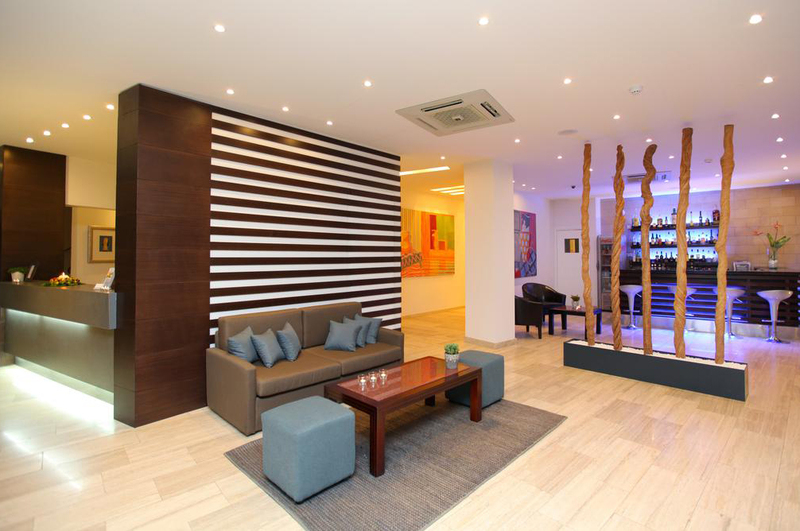 The Hotel features Health Club and fitness centre, 2 swimming pools, Spa treatments, 4 tennis courts and squash court. 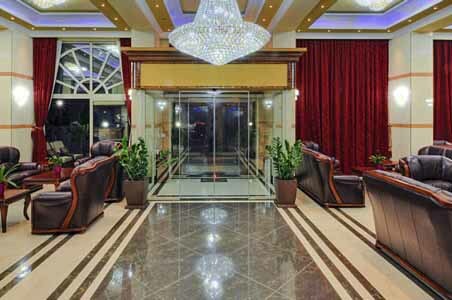 The newly built (2011) Semeli hotel offers a wide variety of facilities and services created to satisfy every need of either a business or leisure traveller. The name Semeli is derived from the Ancient Greek Mythology, and behind it comes a story of Gods, passion and love. Semeli Hotel is just 45 km from Larnaca International Airport, 145 km from Paphos International Airport and is strategically located only a few minutes away from all the major points of interest in Nicosia. Hotel services: 24 hour Front Desk, multilingual staff, daily press, laundry service, room service, free parking, baggage storage room. 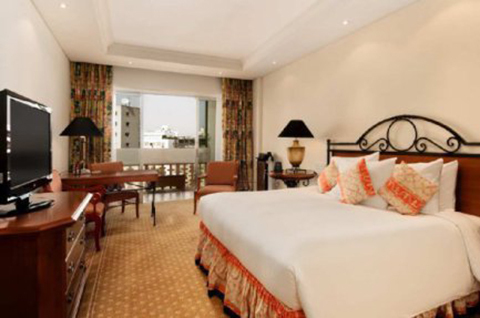 The 5 floor hotel offers 58 elegant, spacious rooms, including 50 double rooms, 6 deluxe rooms and 2 suites. Family rooms are also available and can accommodate up to 4 persons. All guest rooms feature Orthopaedic mattresses, Memory Foam Pillow, working desk, direct-dial telephone line, free WI-FI connection, TV and Pay-TV, hairdryer, mini bar, electronic lock system, individually controlled air-conditioning, tea & coffee making facilities, smoke detectors, sprinklers, balcony and safe deposit boxes. Handicap and non-smoking rooms are also available. The Restaurant offers a high standard service, intending to satisfy our selective guests, offering an exclusive A la Carte selection of international cuisine and a well selected list of superior local and imported wines. A warm and intimate atmosphere, excellent service, and exquisite cuisine is what you will experience when you visit our Restaurant. Semeli hotel features a small area club with Gym and Spa area. The hotel offers a traditional warm Cypriot welcome and, thanks to its intimate and friendly atmosphere it is very much like staying with good friends. Informal in style, the freshly renovated hotel offers the highest standards of comfort and cleanliness, as well as a spacious and comfortable lobby. 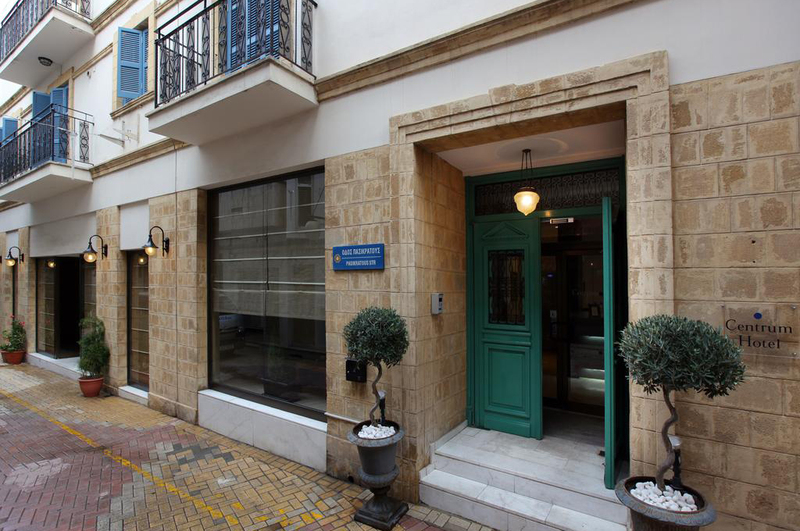 The most centrally located hotel in Nicosia, enjoys a prime position on the historic Eleftheria square, close to the Municipal Hall, the central post office and major banks, the Centrum hotel is just steps away from museums, art galleries and other cultural establishments, making it an ideal base from which to visit the key attractions of this historic city. It is an ideal hotel because one can easily visit the most important and attractive sites of the city. Larnaca International Airport is 45 km drive and Paphos International Airport is situated in the west and is 145 km away. 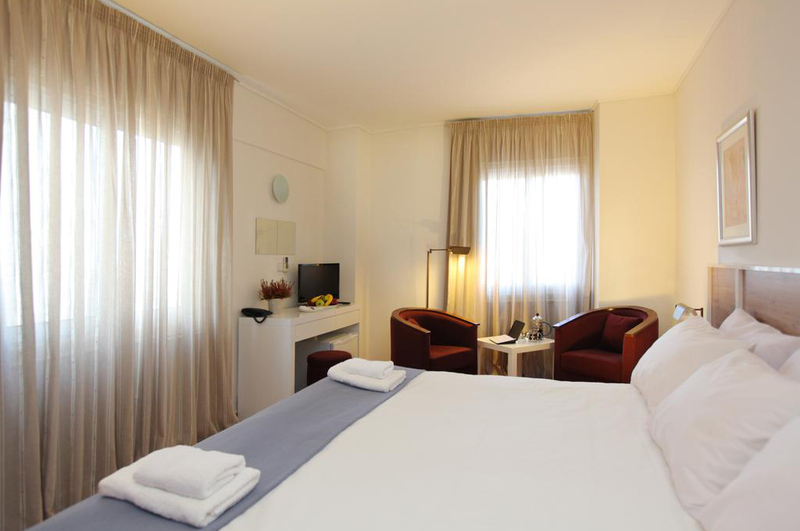 Charmingly intimate, the hotel boasts 40 comfortable rooms and executive rooms as well as a Club Floor that offer space and privacy to ensure a relaxing and fruitful stay in Nicosia.The rooms are well equipped for the demanding guest providing all the comforts of modern living. Free coffee and tea making facilities in all the rooms. 20 inch TV with local and satellite channels. Digital telephone lines with data ports. Free safe-deposit boxes. Individually controlled Air Conditioning and Heating, Hairdryers, Fridges in the executive rooms. Disabled and No Smoking Rooms are also available. You can relax here with a glass of cold draught beer or village wine while watching the passers by, you can also enjoy our traditional Cypriot meze, which consists of many plates of starters and hot dishes. Guests on business have free access to Centrum's work spaces and meeting rooms. The staff team at Centrum is happy to assist leisure guests with any information they may need to make their stay at Nicosia even more enjoyable. Meeting/Banquet Facilities, Business Centre, Babysitting/Child Services, Dry Cleaning, Barber/Beauty Shop, Internet Services, Souvenirs/Gift Shop, Shoe Shine, Packed Lunches, Car Rental, Fax/Photocopying, Wi-Fi/Wireless LAN, Free Wi-Fi Internet Access Included, ATM/Cash Machine on site. Public parking is possible at a location nearby and charges are applicable.